The Tennessee Warbler does not now and never has bred in Tennessee. The name comes from the specimen that Alexander Wilson collected on the banks of the Cumberland River while the bird was on migration in 1811. The breeding range of this is species is almost entirely in the boreal forest of Canada. This dainty songbird has a robust voice and often signals the peak of spring migration in Tennessee. It is a common migrant across the state and is present from mid-April to mid-May and then again from late August to late October. 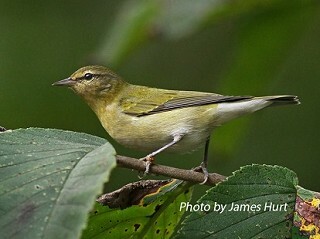 The Tennessee Warbler spends the winter in Central and northern South America. Description: This small drab songbird has a short sharp bill, a thin white line over the eye, an olive-green back, and is white below with a gray wash to the sides. It has no wing-bars, tail-spots, or eye-ring. The male and female are similar in plumage, but juvenile birds are overall more yellow. Voice: The song is a series of several loud, sharp, chips, usually in a pattern of two or three sets. Orange-crowned Warbler has similar plumage, but has yellow under the tail. Vireos are slightly larger, are more robustly built, have thicker and less pointed bills, and are less active when foraging. Habitat: During migration found in woodland, forest edge, and shrubby areas. Diet: Insects, caterpillars, fruit, and nectar. Nesting and reproduction: The Tennessee Warbler has not been documented nesting in Tennessee. Status in Tennessee: Common migrant across the state. The genus name for the Tennessee Warbler was changed from Vermivora to Oreothlypis in the summer 2010 by the American Ornithologists' Union, the authority on bird taxonomy in North America. The Tennessee Warbler is a specialist on the spruce budworm (Choristoneura fumiferana). Hence, the numbers of Tennessee Warblers fluctuate in response to periodic outbreaks of the budworm. During budworm epidemics, the breeding density for this warbler may exceed 50 territories / 25 acres! The first nest of the Tennessee Warbler was not discovered until 1901. Due to the remote area where this bird breeds and the difficulty in finding nests, many aspects of its breeding behavior are still unknown. The Tennessee Warbler often over-winters in coffee plantations in Latin America. It's been suggested that a more appropriate name might be "Coffee Warbler." Rimmer, C. C., and K. P. McFarland. 1998. Tennessee Warbler (Vermivora peregrina). The Birds of North America, No. 350 (A. Poole and F. Gill, eds.). The Birds of North America, Inc., Philadelphia, PA.